There is so much history with respect to La Carrera Panamericana and all of it should be retold and not forgotten. Many of the teams that ran La Carrera Panamericana found many doors of opportunity open before them and went on to other famous venues in racing. By 1953, there were three Indy winners, or winners-to-be, in the Carrera: Bill Vukovich, Ward, and Jim Rathmann. The third son of Jerry and Mary Unser, born in 1934, Bobby (Robert William) Unser began his racing career driving his father’s cars in the annual Mexican road race at age 15. They failed to finish either the 1951 race race or the following year's Carrera as well. By the time he was 18 he was winning races and championships. His goal in his early days of racing was to win at Pike’s Peak. He accomplished this at the young age of 22 in 1956. In the book titled "Winners Are Driven: A Champion's Guide to Success in Business & Life" Bobby Unser explains the story about the time he was racing a Jaguar in the second La Carrera Panamericana which ended in the death of Carlos Panini, a wealthy Italian-born founder of Mexico's first scheduled airline. In 1951, my daddy and I entered the Mexican Road Race as a driving team. I drove and he was the co-driver and navigator of our Jaguar. The Carrera -Pan Americana-Mexican Road Race, the official name for the race......... We went off as the ninety-first car. Even though the race was challenging with turns, heat, and mountains, there were times we could run on a nice, open straight and go about 130 miles per hour. On the second day, we were in seventeenth and coming up to pass the car of millionaire Carlos Panini and he daughter, Terresita. She was the registered driver. However, Carlos was behind the wheel instead and was in ill-health. He shouldn't have been driving. He didn't even have a driver's license. The rules were that the slower car was to allow the faster car to pass if the faster car honked it's horn. We were in the mountains, and I came up to Carlos and honked, but he wouldn't let me pass. This went on through about ten turns, with Carlos blocking me each time. We were probably doing about 90 miles per hour at this point. The next time I tried to pass him, he bumped my right-front fender, which almost pushed me off a sheer cliff to the left that was some 500 to 800 feet down. My left front tire went over the edge, but fortunately I regained control of the car. Carlos over-corrected his car to the right, and went straight into a solid rock wall. The car exploded on impact like an egg hitting a sidewalk. I didn't know it at the time, but Carlos was killed instantly. One of the rules of the race was if you stopped to help anyone, you were automatically disqualified................. Seeing the explosive impact, I wanted to stop to help, but daddy told me to keep going. He knew the rules and told me that people were there to help. That was hard for me-- I slowed down to about 15 or 20 miles per hour. He insisted that I keep going, and grimly, I did. We kept going, passing many more cars. Then we came to the town of Atlisco, about 17 miles from Puebla. I wrecked the car crashing into the town square. A Mexican Army General was there to watch the race. He told me we were in first place at the time, which I hadn't realized. We had passed 17 cars that day, but were out of the race. We fixed the car just good enough to drive the additional 97 miles to Mexico City. When we got to Mexico City, I saw the evening newspapers that already had the headlines about the Panini accident. I learned a new Mexican word: muerte (dead). As much as I'm a highly driven person and want to win, I understand and accept reality. Some people don't understand reality, and that's what kills them in racing. It's also what kills a person's career in business. This is probably the most complex part of me for people to understand, yet it's so simple when you really think about it. I want to win very much, but I'm not willing to do stupid things just to win. I need to finish and stay alive, and race again tomorrow. You will be able to keep going on your journey when you accept the tough reality failure brings. Carlos Panini was of Italian origin, most probably from the province of Como in Lombardia region. He was a pioneer of Mexican aviation, and founded an airline, Servicio Aéreo Panini, in 1934. He is credited with being the first pilot to fly a light plane around the world. 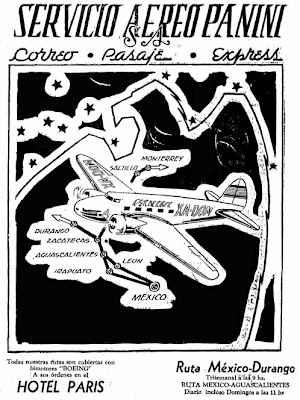 In 1927 he had established Mexico's first scheduled airline, which he sold in 1951 with plans for his retirement. He died when his car crashed during the second stage from Oaxaca to Puebla, of the second Carrera Panamericana. Although the registered driver for the race was Carlos' daughter Teresa (Teresita) it seems that he was at the wheel of car, despite he not having a valid license and being in ill health. The accident happened while a young Bobby Unser was trying to overtake Panini. Panini was traveling slower and had blocked Unser for quite a long time. After several attempts Unser forced his was past but the two cars touched. Unser managed to control his Jaguar, while Panini's 1949 Alfa Romeo 6C 2500 SS went straight into a wall. Ricardo Ramirez of Mexico City abandoned the race to rush the Paninis to a hospital in Puebla, but he was dead on arrival. Teresa Panini survived the accident with minor injuries. Newspapers gave his age as 54. Carlos Panini was the third of three drivers killed in the 1951 running of the Carrera Panamericana. Jose Estrada Menocal and co-driver Miguel Gonzalez died the day before, on 20 November 1951. This print is a must have. Don't kid yourself, it's NOT a rally. 1954 Lincoln Capri La Carrera Lincoln For sale!!! Was I dreaming or what!